Once again it’s that time of year when, having just completed a Fifth Doctor (Peter Davison) trilogy in Big Finish’s main range of monthly Doctor Who releases, we somewhat confusingly get one more Fifth Doctor adventure – the start of a multi-Doctor trilogy. The difference this time is that the other two stories in the set will not immediately follow on a monthly basis but will be issued more occasionally over the coming year. The linking theme of this trilogy is UNIT, an organisation that featured regularly during the Third Doctor era, but never teamed up on screen with the Fifth Doctor (though he did meet a retired Brigadier Lethbridge-Stewart on a couple of occasions and worked with UNIT in prose – the short story ‘The Nemertines’ in the Doctor Who Annual 1984 and the novel Deep Blue). Adding to the novelty value is the fact that the UNIT personnel introduced here comprise a completely new set of characters, distinct from those who appeared in the classic series, the revived series, and even the audio-only group depicted in Big Finish’s 2004–5 UNIT range. The Doctor’s (and therefore our) main point of contact with UNIT in The Helliax Rift is Lieutenant Daniel Hopkins, played by Blake Harrison in a performance that’s a million miles from his dim-witted Neil in The Inbetweeners. He is very much the Doctor’s companion in this story. Though he’s a Medical Officer, he has less in common with Harry Sullivan than with the plain-spoken John Benton – especially when it comes to his reaction to the TARDIS interior. Like Benton, Hopkins is wary of unusual situations, but steps in and does his duty anyway. His Commanding Officer is Lieutenant-Colonel Lewis Price (Russ Bain). In contrast to the often chummy partnership that the Doctor enjoyed with the Brigadier, this CO does not trust the Time Lord at all, regarding him as a deserter from his post as UNIT’s scientific advisor. Also on the staff is Genevieve Gaunt as Corporal Linda Maxwell, though she doesn’t get much of a chance to shine in this adventure – maybe next time. The first couple of episodes are relatively short (24 minutes each) and low on incident, though they do set up an intriguing conspiracy surrounding the occupants of various crashed spacecraft. Clandestine medical examinations bring to mind the Roswell incident, which was a hotly debated topic among ufologists in the 1980s, when this story takes place – though there’s also a dash of Burke and Hare from a century earlier in the characters of Morris (Robbie Stevens) and Samuel (Jacob Dudman). In the third episode, the recollections of Annabel Morden (Deborah Thomas) get decidedly Starman, but then the direction of Scott Handcock’s narrative twists again and more modern themes of parental rights and responsibilities come into play during the fourth and final episode. Also in keeping with the period is the fact that the Doctor is briefly mistaken for a vet (before taking on his Doctor Who role, Peter Davison was best known for playing Tristan Farnon in All Creatures Great and Small), though this is an in-joke that 1980s producer John Nathan-Turner would probably not have allowed! 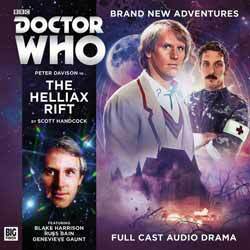 Having dissected and analysed the subject, I find that The Helliax Rift makes for a refreshing close encounter of the Fifth Doctor kind.